Aside from the usual, “what’s your favourite country,” and “how do you make money?” the question I get asked the most by people is what I do, and where I go for a “vacation”. Well, a while ago I answered that a bit with my article on defining the word vacation, but I’ve never really shown you how I do it. The truth, as you may assume, is that as a professional traveller of any kind, you really can’t go travel to get away from things. For me, a vacation is 100% escapism. Even if you’re life is awesome, you should try to escape for your regular every day activities to have a bit of a holiday. As a travel photographer, this is how I do it. This is key, as you’ll find out in future steps. Find a hotel that is beyond comfortable. In fact, it should be at least 3 or 4 times your usual budget. It should be the type of hotel you don’t want to ever leave because you paid so much money for it that you want to get your money’s worth. 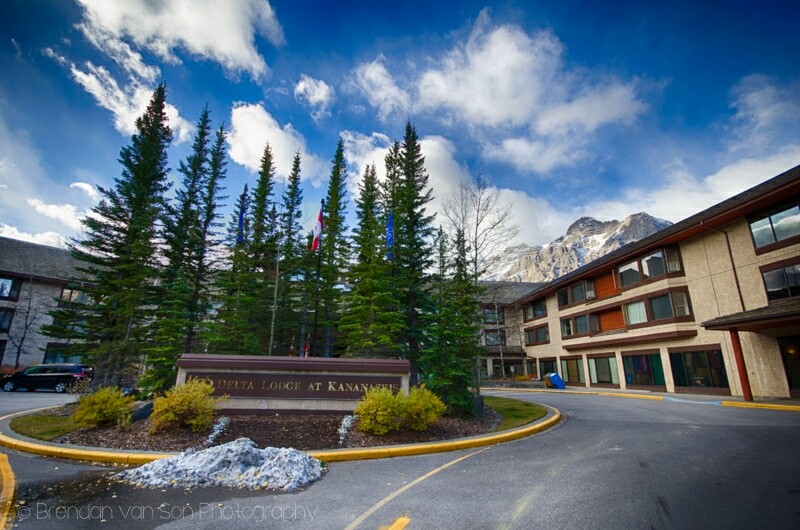 I chose the Delta Lodge at Kananaskis because it really is one of my favourite hotels in the world to just chill out at. If I want to do some photo or video uploading, the internet speeds are the fastest I’ve seen anywhere else in the world. Their rooms are also really smartly set up for the technical side of things. For example, they’ve got cables ready to go so you link your computer to the big screen TV in the room. The hotel is just great for a traveller’s vacation from travelling. This, for me, is key. When you’re travelling, you always want to be exploring. And even if the things you’re doing are relaxing, they aren’t as relaxing as just sitting back and binge watching an entire season of Brooklyn Nine Nine. Get room service for your meals, don’t let the cleaning ladies clean, and just hang out. Your room is your sanctuary. My room at the Delta Lodge was unreal. I had two floors, an awesome multi-media desk, and a welcome tray including some great cheeses and other snacks. As I prove with this article and the video, this is a tough one for me to do. However, if you want a real vacation, you really need to disconnect from the outside world and your work world. You need to shut off your computer, unless you’re using it to watch TV or movies, you’re not allowed to check your emails, and you should also switch off your cell phone. You need to go zen with this stuff, disconnect completely. And though I broke most of these rules by filming this video, you will note that there’s no photos from the lodge this time around, so I didn’t fail completely. If you’re like me, you’ll crack open a bottle of wine just before lunch and have a bit of a drink. However, gluttony of any kind is highly recommended if you’re a traveller on vacation. If you don’t drink, you can substitute the excess alcohol with chocolate, sugar, or whatever your vice may be. Excess is the name of the game with this step, and it’s really important to take this seriously. If you’re not eating too much chocolate or drinking too much wine, you’re doing this wrong. The only time leaving the room on your vacation from travel is allowable is if it’s to achieve greater relaxation. If you’re the massage type, and I’m not, head down to the hotel’s spa and get one of those fancy hotel rock massages. If you’re like me and think massages are uncomfortable, painful, and completely unpleasant, find a hot tub, jacuzzi, steam room, or sauna. You should only be leaving your room if it will lead to greater relaxation. How do you Vacation as a Traveller? Even if you’re not a full-time traveller, most people travelling need a bit of a break from travel. So, I’d like to know how you do it. Let me know in the comments. As usual, I’ve got a bunch of on location travel photography videos coming up from some cool spots. I’ve also got some photography gear reviews coming up in the coming weeks. I’m still in Western Canada, and I’m going to be here until about Christmas, so there should be some cool things from my homeland, which is a fun change. Stay tuned! Next ArticleHow to Make them Mountains Sing! Mate, when are you going to Peru?? I’m running a photography workshop and tour there for 14 days in May. I used to be a tour leader there, and my educational background is in Latin American Politics. It would be awesome if you joined on! The details are going to be released in a couple weeks.